OK, so I’m probably showing my age with this blog title (it’s a rip off from a 70’s K.C. & The Sunshine Band song). Oh well! 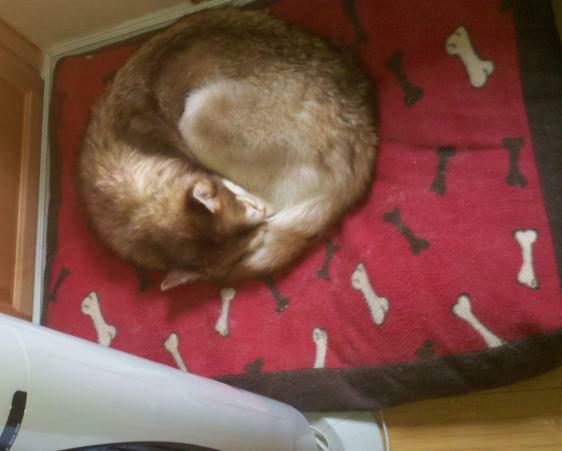 Tuesday, April 26, 2011 – I came home at approximately 6:00 p.m. to discover that Dax was missing. Brandon and I immediately went out looking all around the East Hill area (Kent, WA) within a 5-mile radius from our home. We asked everyone that we saw if they’d seen Dax. Brandon, his parents, my parents, and I searched until dark and found nothing. I called the KC Animal Control & Shelter in Kent but Dax was not listed as a found stray. Thursday, April 28, 2011 –I went to the MPP website and after reading about skittish, xenophobic dogs, and some of the information on what to do and how they react, I called MPP and Chris (the MPP dispatcher) and volunteer Jim Branson were both able to give me tips and ideas on what to do to find Dax. I went again to the KC Animal Shelter after work to check. With no trace in sight, we again returned home for the night. Friday, April 29, 2011 – Brandon had the day off and staked out the neighborhood where Dax was last seen with no luck. As suggested on MPP’s website, we made neon posters and figured out what spots the majority of people going home or down to the major highways would have to stop, or at least see, our neon signs. We went to the shelter, but she still was not found. At 1:00pm we got a call that Dax was seen sniffing one our neon posters but was spooked when a car drove by. Like every call or tip we received she was described as terrified (one person said “running for her life”) and extremely fast. Saturday, April 30, 2011 – Kat Albrecht from MPP was able to come by our house. She gave us instructions on how NOT to call a panicked dog and how to use food to attract Dax but while ignoring her. She also gave us Neomarker pens and instructions for us to “tag” the back windows of our cars with Dax’s info and provided neon posters to put out. It was extremely helpful and I was so touched she and her colleague came out to give us support, information, and help. To our disappointment, not one call came in that day about Dax. Sunday, May 1, 2011 – We went out as usual to the last places she was seen earlier in the week and to make sure our signs were not yet pulled down or fix if they had fallen down/over. The day ended with not one phone call of a sighting on Sunday. Monday, May 2, 2011 – Brandon headed out after getting a call at 10:30am from a woman who saw our Craigslist post. 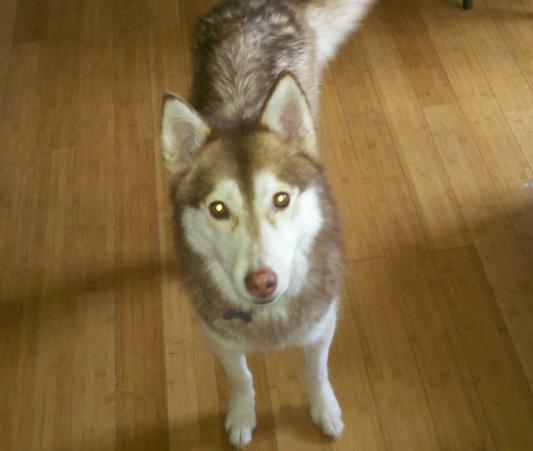 She said she saw Dax Sunday evening near 113th Place SE off of 116th Ave SE. Brandon rushed over there and ended up turning down the wrong street. While trying to find his way, Brandon spotted Dax! How Brandon got Dax back: Brandon drove close to where Dax was walking but she saw his car and trotted faster the direction she was headed**. Brandon stopped, got out with the zip lock bag of dry dog food I had given him and threw the entire bag halfway between him and Dax. She stopped, turned around and looked at him. Brandon crouched down (a calming signal) so that he was no longer standing and began acting like he was foraging for food (by using his hands to fiddle with the food), not looking at Dax. Moments later when Dax got close enough to Brandon, she sniffed him. He knew she’d recognized him when she licked the back of his neck! Brandon was then able to grab Dax by the collar and head home. Brandon said Dax howled excitedly the entire drive home! (**Note from Kat: Many skittish dogs that have been chased by so many people on foot and even in cars can sense when someone is following them so they speed up! You’re better off to drive 5 to 7 houses up ahead of the dog so you’ll have time to stop your car, calmly climb out, and sit or kneel with food and focus on moving the food with your fingers while ignoring the dog. It is critical that you LOOK AT THE FOOD, NOT AT THE DOG! Actually, you can watch your dog out of the corner of your eye but your dog will only calm down if he senses that you’re more interested in foraging for food on the ground than in staring at him or walking towards him or calling his name. This is the same advice that we gave to Brandon and Marisa). Dax, Home Where She Belongs! The Dax case is the perfect example of the highly effective recovery technique of strategically placed giant, neon REWARD LOST DOG posters, the active posting of LOST RED & WHITE HUSKY Ad’s on Craig’s List, and “Calming Signals. Every person, even one of Dax’s own family members, who called Dax simply caused her to bolt in a panic. Thankfully, three MPP volunteers (Chris the dispatcher, Jim Branson, and myself) all explained lost dog calming signals so that the moment that Brandon finally DID see Dax, he knew exactly what to do. Sadly, many animal shelters and humane socities give out improper lost pet recovery advice like, “Call your pet’s name loudly and often.” Calling a displaced lost cat or a xenophobic lost dog (like Dax) is not only pointless, it can actually make matters worse! Please share this pet detective blog with your local shelter and ask them to refer dog and cat owners to Missing Pet Partnership’s web site.